Powerful and Pure. Verdecanapa launches its most powerful CBD oil for the first time, with a concentration of 10% cannabidiol. It is extracted from hemp varieties with a high concentration of CBD and a low THC content. The plants are grown organically, without any use of pesticides or herbicides, in order to obtain a product of the highest quality. Verdecanapa launches its most powerful CBD oil for the first time, with a concentration of 10% cannabidiol. It is extracted from hemp varieties with a high concentration of CBD and a low THC content. The plants are grown organically, without any use of pesticides or herbicides, in order to obtain a product of the highest quality. CBD Verdecanapa oils guarantee the highest quality and purity thanks to the accurate extraction processes that allow us to keep the highest number of cannabinoids contained in hemp plants, eliminating only potentially dangerous additives, chemicals and other contaminants that could reduce the overall effectiveness of this beneficial food supplement. In addition, our 10% CBD oil is absolutely free of psychoactive effects, so you can take it anytime, anywhere. We are committed to complying with all CBD regulations. Our oils are produced with maximum transparency, in every single processing phase. They can be purchased legally in almost all European countries. Ensure that your country adheres to the free marketing of CBD and consult a doctor if in doubt. Taking CBD oil is simple and discreet. Our dropper bottles are very practical to use, always ensuring an extremely precise dosage. Being our most powerful oil, it is recommended to start with a dosage of 3-4 drops 3 times a day. CBD oils can be applied directly under the tongue or on dishes. After checking your body's response, you are free to adjust the dosage. We do not use preservatives or additives to dilute our products. This is why we recommend storing 10% CBD oil in the refrigerator once the package has been opened. Cold pressed hemp seed oil, cannabidiol. The ingredients come from Cannabis cultivation with THC within the limits established by the law: it does not contain psychoactive. The pack contains 10 ml of organic hemp extract with 10% (1000 mg) of CBD. In a bottle it is estimated there are about 300 drops. 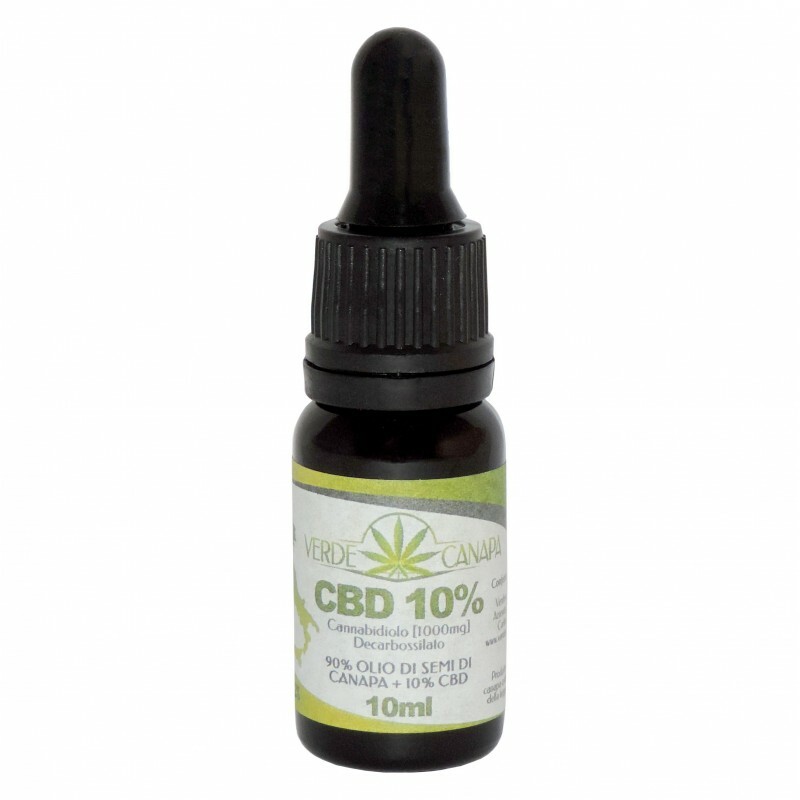 A single drop contains 3 mg of CBD. Store in a cool, dry place away from light. Shake well before use. This hemp extract is a simple way to manage and take CBD. You can easily increase or decrease the dosage with the dropper. CBD is an extract of cannabis with enormous therapeutic potential. verdecanapa.com does not provide medical or food advice. The properties and characteristics have been found on the internet in various authoritative sites such as wikipedia.org. In case of doubt about the use or not of our products, please consult your doctor, verdecanapa.com by Verdenergia srl Azienda Agricola does not provide any advice or prescriptions of any kind and disclaims any responsibility for the use of the products.